← Looking back as we celebrate our 75th year of service to the Ridgefield Community! 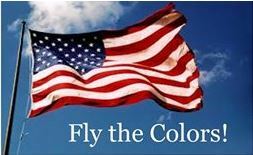 The Rotary Club of Ridgefield has re-launched its innovative program that encourages the patriotic display of the American flag on six American Holidays Proceeds from the project, called “Fly the Colors,” will be used to benefit veterans and their immediate families from this area. Rotarians place an American flag in front of participants’ houses for six holidays and remove it after the celebrations are over. The events are Memorial Day, Flag Day, The Fourth of July, Labor Day, Patriot Day and Veterans Day. The flag program is an annual, subscription-based service. The first year cost is $50; thereafter it is $25 a year. If you would like to participate for the first time, you prefer to renew online or you would like to learn more, just click here. The Ridgefield detachment of the Marine Corps League and Ridgefield Supply Company are partners in the project, providing guidance on operations, logistical help, and materials for the installation and removal of flags. Here’s how the program works: A plastic pipe will be buried permanently in front yards, near the street and flush with the ground, to hold the flag staff in place. A plastic cap will cover the pipe when not in use. A marker will be put in the street to indicate the location of the buried pipe. A 3×5 foot flag on a 10-foot staff will be placed in the holder. Installation will be in coordination with “Call Before You Dig” and Ridgefield Public Works. Homeowners will be asked to notify the installers of underground installations such as sprinkler systems or invisible dog fences near the curb. If you subscribed last year, you will receive a renewal notice and can accept the invitation to re subscribe and have a flag placed in front of your home in time for the upcoming Memorial Day. This entry was posted in Raising Funds to Help Others. Bookmark the permalink.